The paper provides a review of the background, components, indicators and revealed effects of Hungary's trade competitiveness at the macroeconomic and sectoral levels, in particular in the manufacturing industry. These features are described and interpreted in two respects: first, in terms of their evolution during the nineties; and secondly, on the basis of an international comparison. Hungary, after suffering from a deep recession in the early years of the political and economic transformation, experienced considerable improvements in both the 'real' and the 'nominal' components of international competitiveness. First of all, labour productivity, particularly in manufacturing, grew at an outstanding rate, mainly due to FDI-inflows. As for the 'nominal' side, labour costs expressed in foreign currency terms increased modestly in comparison with both other transition countries and gains in domestic productivity. As a consequence, the real exchange rate index based on unit labour costs improved markedly, especially in the period 1995-1999. Actual trade performance of the country reflected the positive changes in relative productivity and costs. In the second half of the 1990s, Hungary's trade share on EU markets (in manufacturing products) increased by 1 percentage point. As for the components of that market share increase, roughly 80% can be attributed to improved competitiveness. The pronounced increase in manufacturing output, productivity and exports was based on profound structural changes, which involved exceptionally rapid expansion in a limited number of branches/activities (viz. motor vehicles and office machinery) and slower growth or shrinkage in a number of others. 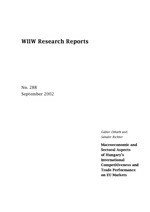 In the last section of the paper an attempt is made to interpret the recent sharp changes in the factors underlying Hungary's international competitiveness (nominal appreciation of the forint combined with a sharp increase in nominal wages and a slow-down in productivity growth in the manufacturing sector).